Air Music Technology have a respected history as the makers of the Loom II, and Vacuum Pro synthesizers, so their new drum machine, Drum Synth 500, should be one to take notice of. Why the '500' tag? Well, Drum Synth 500 comes with 500 drum sounds presets, 500 samples, 50 whole kits using them in coherent combinations, and 500 MIDI grooves to play them with. 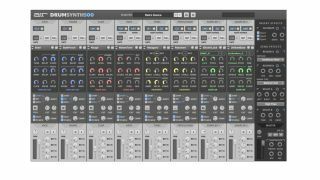 Down to the nitty gritty, the plugin has multiple ways of generating the different kinds of drum and cymbal sounds, with bespoke parameters for controlling each. For kicks and snares, the order of the day is analogue-style synthesis with Tune, Decay, Curve and Drive controls; claps and hats are created using noise synthesis, with bespoke controls including Color, Claps and HPF; toms and percussion, meanwhile, are generated using FM synthesis and setting levels and tuning for the operator pairs. And for any 'none-of-the-above' sounds you want Drum Synth 500 to spit out, there are two sampler slots for loading the included sounds or importing your own. Other features include MIDI note selection, randomisation features, and a mixer that gives control over double delay and reverb sends, mute, solo, level and pan. You can grab Drum Synth 500 over at the AIR Music Tech website for an intro price of $99.99, later rising to $149.99. It runs as a VST, AU or AAX plugin for Mac and PC.